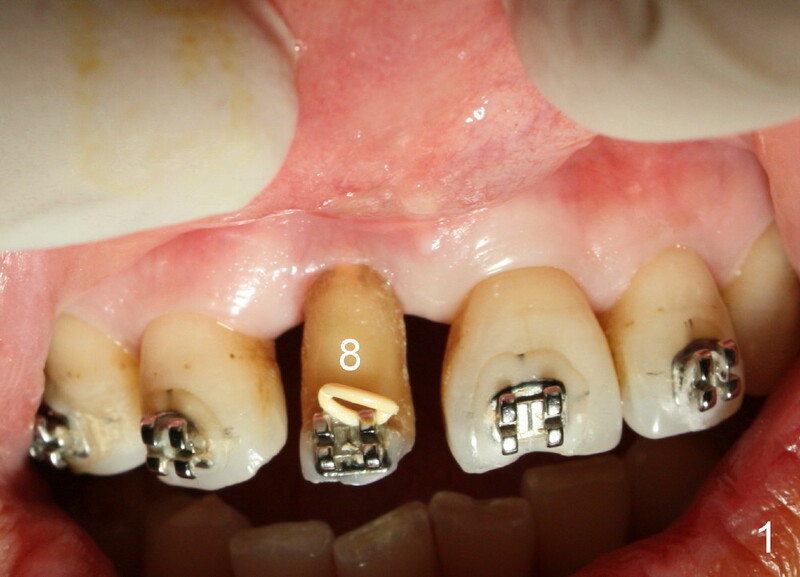 Orthodontic extrusion does not achieve its purpose. 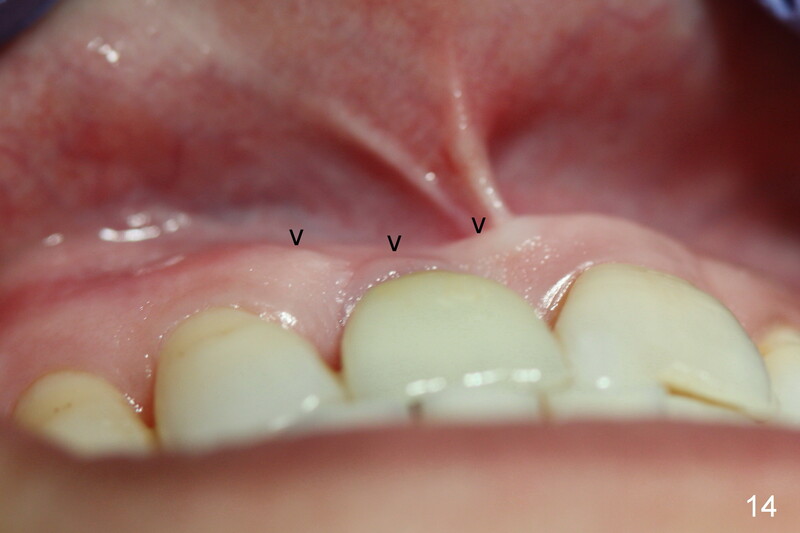 The labial gingiva of #8 does not have keratized tissue in addition to the concave labial ridge (Fig.1,2*). There is also vertical bone deficiency (Fig.3). The uncontrolled diabetic patient has a low smile line. 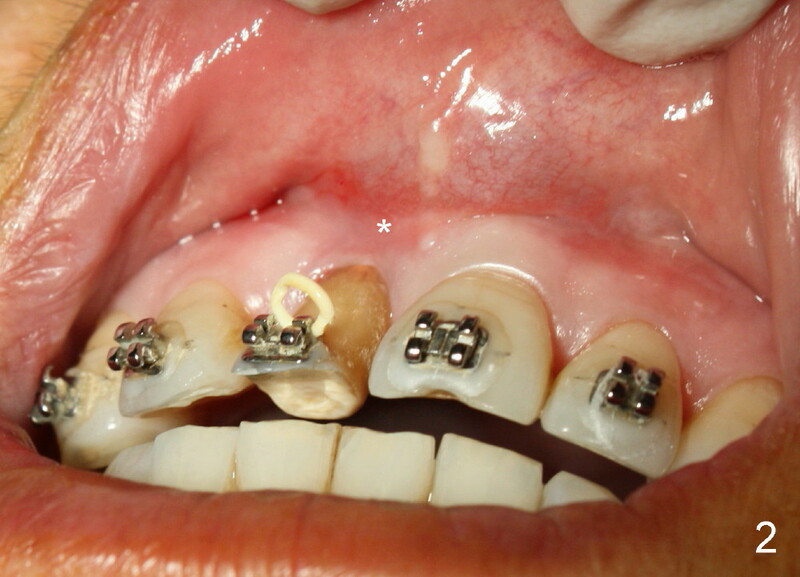 Interdental papillae are more or less within normal limit. 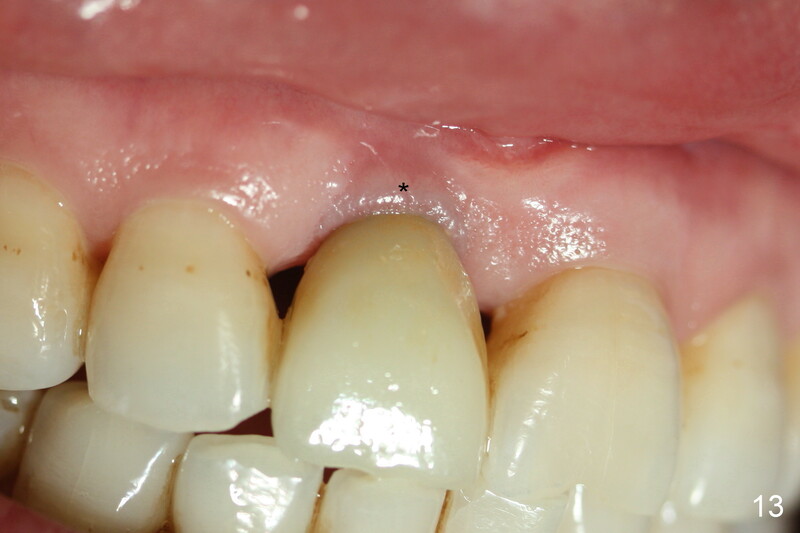 When the tooth is extracted, there is no inflammatory granulation tissue. 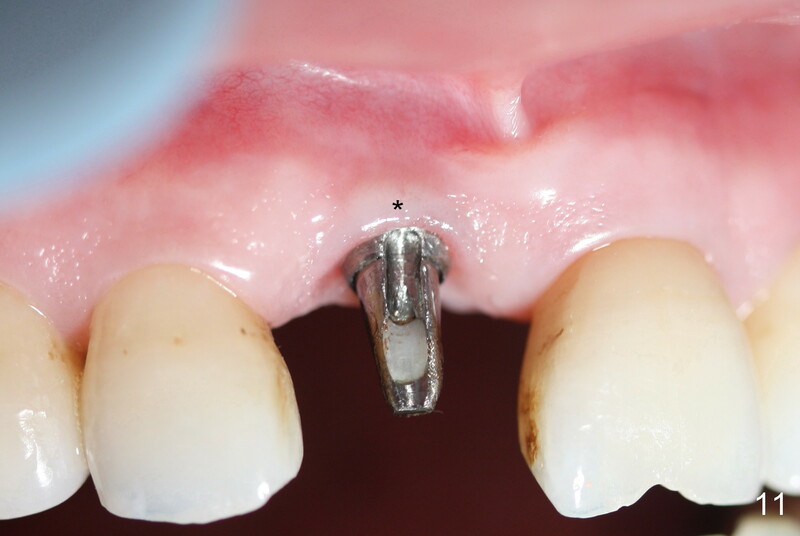 Osteotomy starts in the palatal aspect of this shallow socket with 2 mm pilot drill (Fig.4). 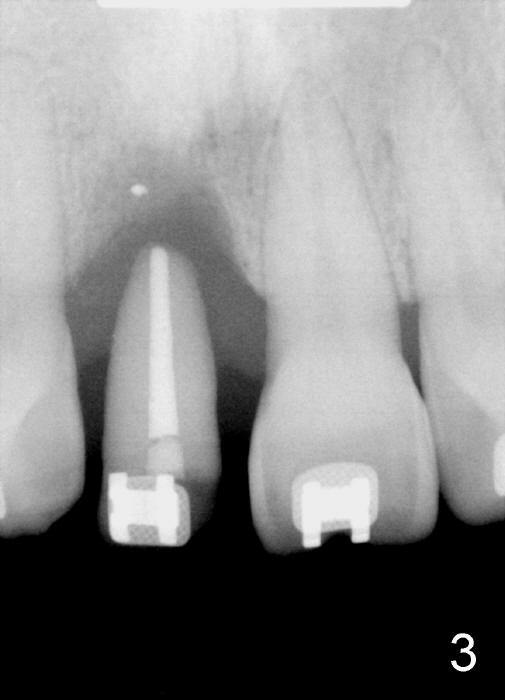 When 3 mm reamer is being used for osteotomy (Fig.5), the labial plate is palpated thin. 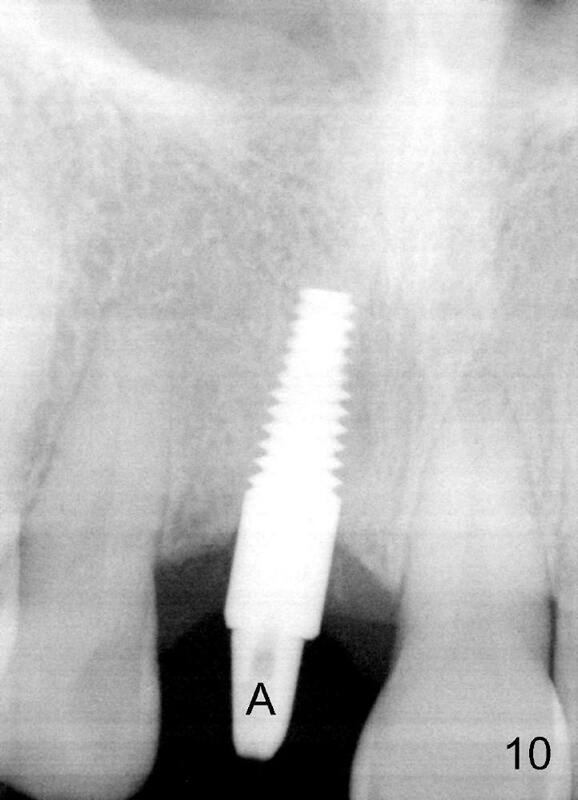 It is felt that the plate may be perforated when the 3.5 and 4 mm reamers are used. 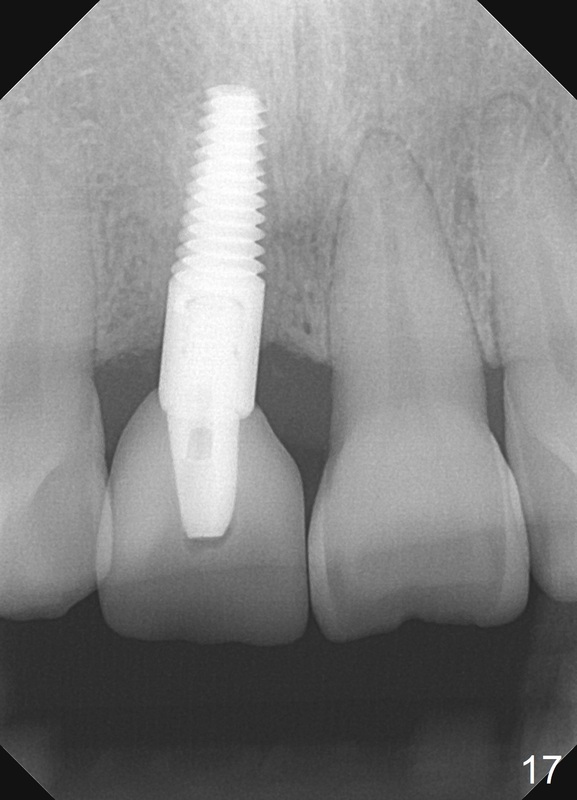 A screw-type tapered implant is placed with insertion torque >60 Ncm (Fig.6: 4x14 mm). 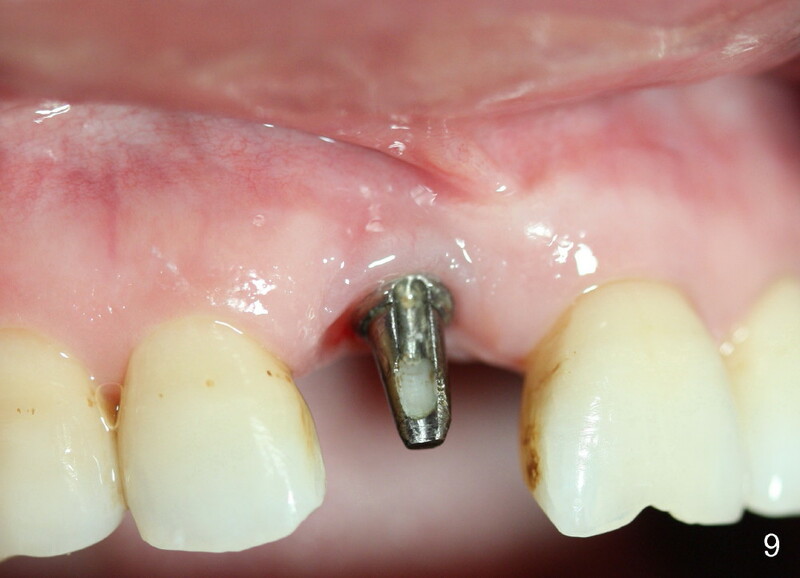 A 3 mm 20 º angled abutment is inserted for fabrication of immediate provisional; autogenous bone is placed around the implant before provisional cementation (Fig.7,8). 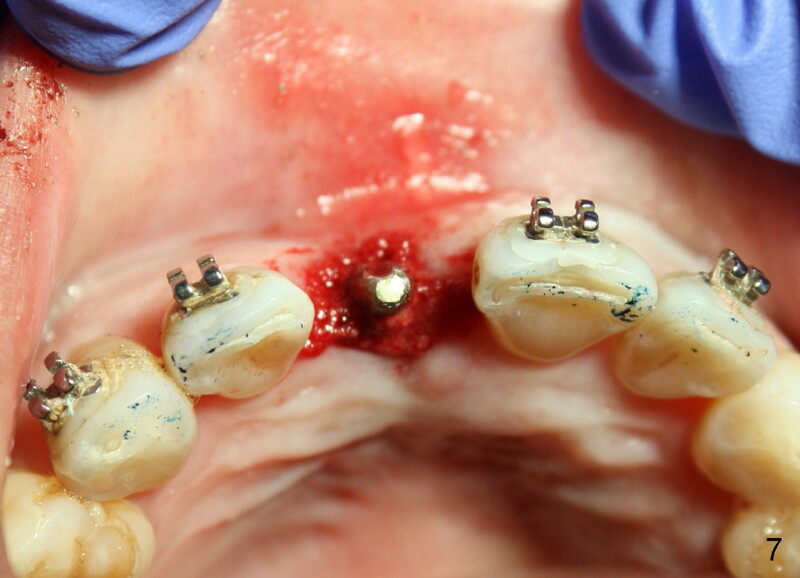 It is thought that this minimal invasive approach may obtain some cosmetic results. The patient returns for final restoration 10 months postop (Fig.9,10). 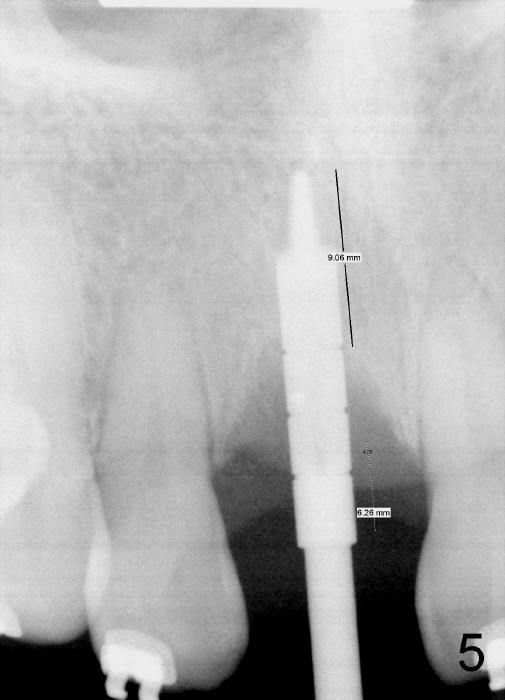 The gingival line appears to be symmetrical; there is bone regeneration (Fig.10, compare to Fig.6). 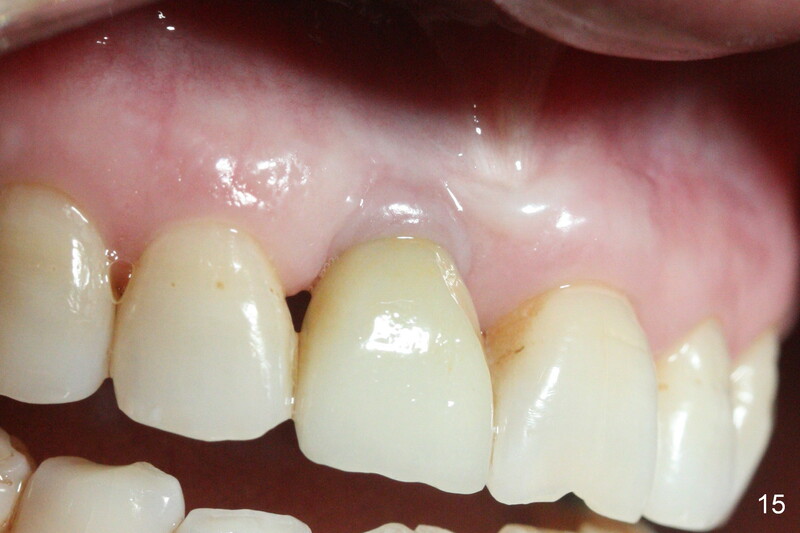 The buccal gingiva appears to turn dark when a definitive restoration is cemented (Fig.11,12 *) and remains so 2 months post cementation (Fig.13). 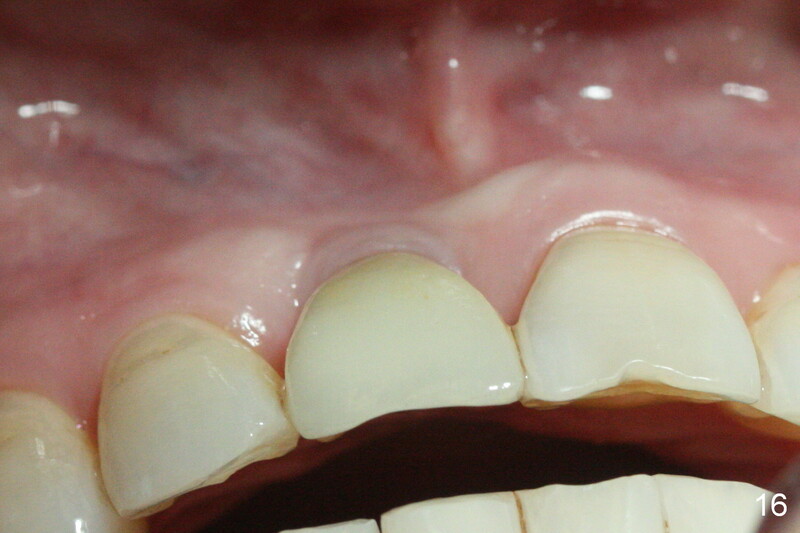 It may be due to buccal plate atrophy (Fig.14 arrowheads). 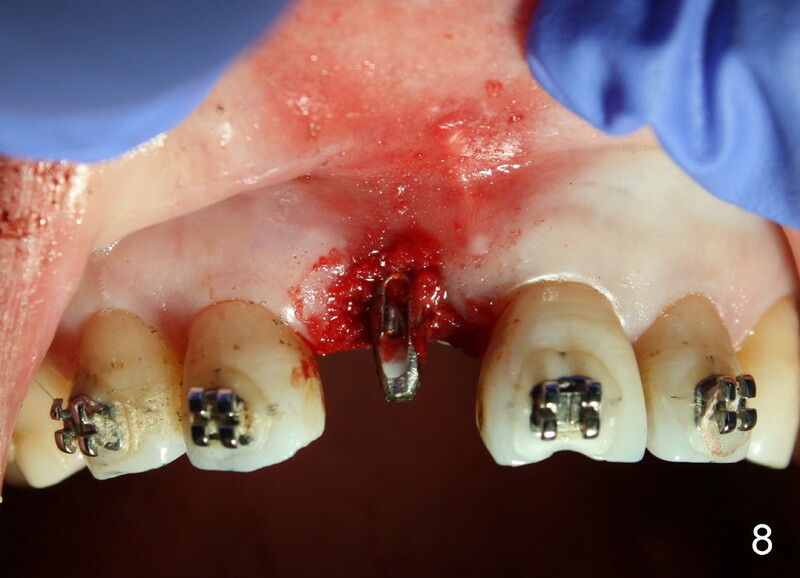 More aggressive bone graft and connective tissue graft is required. 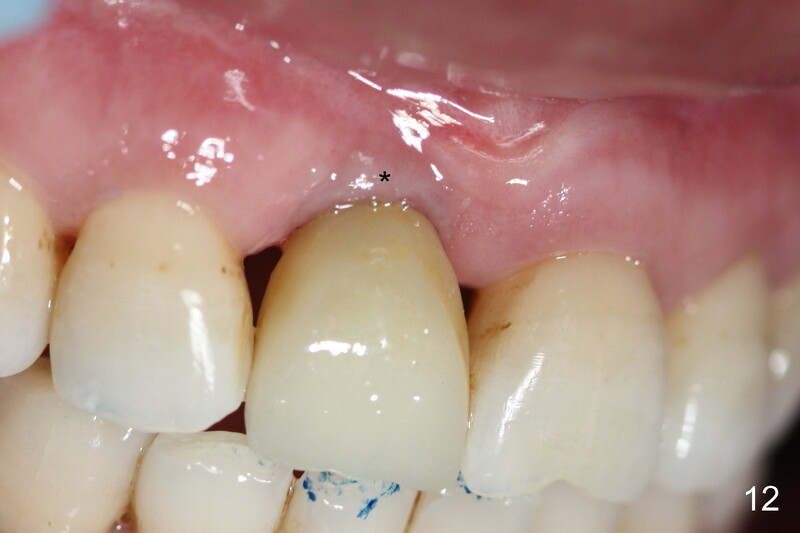 The black triangles reduce with the increased buccal keratinized band 23 months post cementation (Fig.15,16). 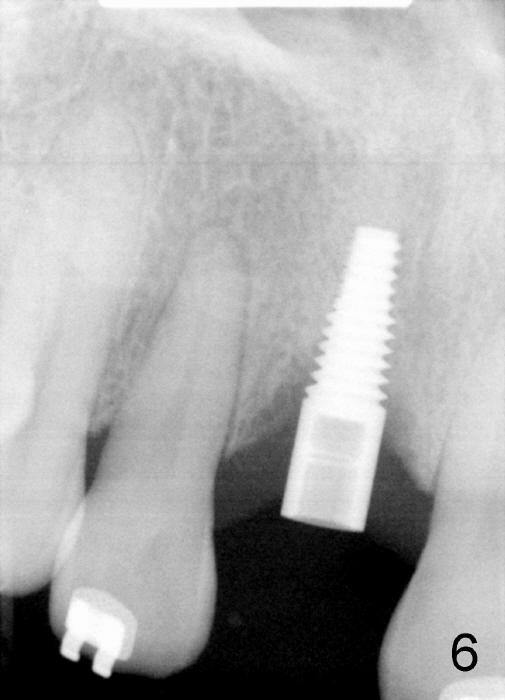 The patient is pleased with functional and cosmetic results. 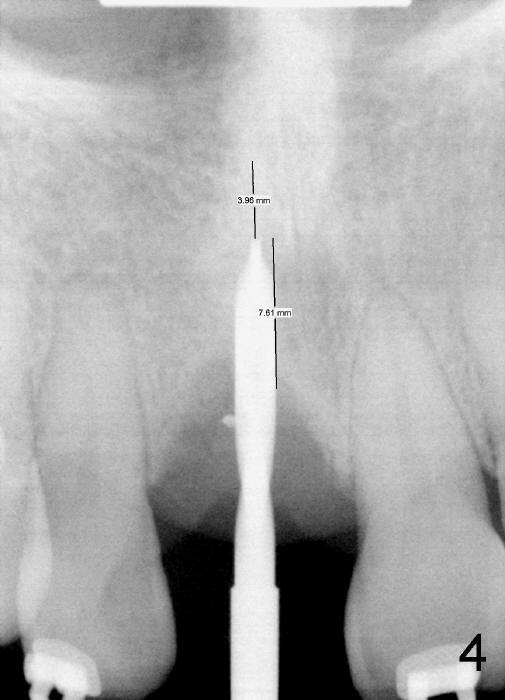 There appears no bone loss 2 years 8 months post cementation (Fig.17).